“Clean this mess up or else we’ll all end up in jail…those test tubes and the scale…just get ’em all outta here…” He was referring to the complex super-critical-CO2 hop extraction equipment set up on the table in the lab across from the brewhouse. Hop extracts are for the BIG brewers, he thought – suitable only for crummy sub-standard and barely-passable industrial lagers, not the subtle and elegant craft beer made here. But wrong he was. The New Brewer does not eschew any possible inputs. In this case the mountain of extracts will replace the mountain of hop vegetative material in the kettle thus creating cleaner hop flavors and preventing the otherwise spinach-like mess of a kettle full of super-hopped wort from clogging up a pump or worse. The sensuous honey-like amber ooze was administered intravenously to the wort kettle and the sacrament was complete. 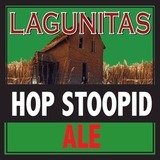 Another kettle of Hop Stoopid is once again raised up and fermented on high.